Calcium homeostasis is a complex process involving the following 4 key components: serum calcium, serum phosphate, 1,25-dihydroxyvitamin D-3, and parathyroid hormone (PTH). More than 99% of the total body calcium is stored in bone in the form of phosphate and hydroxide salts, predominantly as hydroxyapatite. Normally, a very small portion of this calcium is available for exchange in the serum. A schematic diagram of calcium homeostasis can be seen below. Schematic diagram of calcium homeostasis. Parathyroid hormone (PTH) is a polypeptide containing 84 amino acids that is secreted by the parathyroid glands after cleavage from preproparathyroid hormone (115 amino acids) to proparathyroid hormone (90 amino acids) to the mature hormone. The major target end organs for parathyroid hormone (PTH) action are the kidneys, skeletal system, and intestine. The primary response to parathyroid hormone (PTH) by the kidney is to increase renal calcium resorption and phosphate excretion. In the kidney, parathyroid hormone (PTH) blocks reabsorption of phosphate in the proximal tubule while promoting calcium reabsorption in the ascending loop of Henle, distal tubule, and collecting tubule. Parathyroid hormone (PTH) promotes absorption of calcium from the bone in 2 ways. The rapid phase brings about a rise in serum calcium within minutes and appears to occur at the level of the osteoblasts and osteocytes. Although it may seem counterintuitive that the cells that promote deposition of bone are involved in resorption, these cells form an interconnected network known as the osteocytic membrane overlying the bone matrix, but with a small layer of interposed fluid termed bone fluid. When parathyroid hormone (PTH) binds to receptors on these cells, the osteocytic membrane pumps calcium ions from the bone fluid into the extracellular fluid. The slow phase of bone resorption occurs over several days and has 2 components. First, osteoclasts are activated to digest formed bone, and second, proliferation of osteoclasts occurs. Interestingly, mature osteoclasts lack parathyroid hormone (PTH) membrane receptors; activation and proliferation appear to be stimulated by cytokines released by activated osteoblasts and osteocytes or by differentiation of immature osteoclast precursors that possess parathyroid hormone (PTH) and vitamin D receptors. 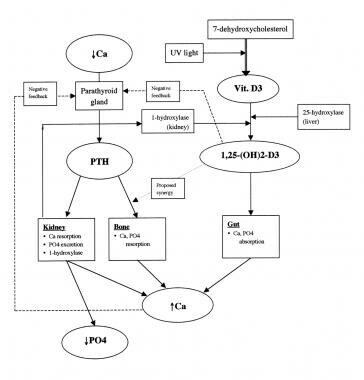 The final important function of parathyroid hormone (PTH) is conversion of 25-hydroxyvitamin D to its most active metabolite, 1,25-dihydroxyvitamin D-3 [1,25-(OH)2 D3], by activation of the enzyme 1-hydroxylase in the proximal tubules of the kidney. Feedback inhibition of parathyroid hormone (PTH) release occurs primarily by direct effect of calcium at the level of the parathyroid gland. Although not well elucidated, 1,25-(OH)2 D3 appears to exert a mild inhibitory effect on the parathyroid gland as well. Vitamin D-3 (cholecalciferol) is formed in the skin when a cholesterol precursor, 7-dehydroxycholesterol, is exposed to ultraviolet light. Activation occurs when the substance undergoes 25-hydroxylation in the liver and 1-hydroxylation in the kidney. The primary action of 1,25-(OH)2 D3 is to promote gut absorption of calcium by stimulating formation of calcium-binding protein within the intestinal epithelial cells. Vitamin D also promotes intestinal absorption of phosphate ion, although the exact mechanism is unclear. Negatively charged phosphate ion may passively flow through the intestinal cell because of flux of the positively charged calcium ion. In bone, vitamin D may play a synergistic role with parathyroid hormone (PTH) in stimulating osteoclast proliferation and bone resorption. Compared to parathyroid hormone (PTH), vitamin D exerts a much slower regulatory effect on calcium balance. Primary hyperparathyroidism (HPT) is defined as abnormal hypersecretion of parathyroid hormone (PTH), producing hypercalcemia and hypophosphatemia. In the face of persistent hypercalcemia, parathyroid hormone levels should be low due to feedback inhibition of the parathyroid glands. Thus, even high normal parathyroid hormone levels are considered pathologic in patients with chronic hypercalcemia. Primary hyperparathyroidism (HPT) is the most common cause of elevated parathyroid hormone (PTH) and calcium levels. Approximately 85% of cases are found to be caused by an isolated parathyroid adenoma, 15% by diffuse parathyroid hyperplasia, and less than 1% by parathyroid carcinoma. Other causes include neck or mediastinal parathyroid cysts, which are also uncommon. Rarely, primary hyperparathyroidism (HPT) may be related to multiple endocrine neoplasia (MEN); family history or other endocrine tumor warrants screening for MEN. MEN syndromes have an autosomal dominant hereditary pattern with a predilection to develop tumors of the endocrine organs, including the parathyroid glands. Parathyroid hyperplasia is seen in both MEN 1 and MEN 2a. MEN 1 is characterized by parathyroid hyperplasia, pancreatic islet cell tumors, and pituitary adenomas. MEN 2a includes parathyroid hyperplasia, medullary carcinoma of the thyroid, and pheochromocytoma. Incidence of primary hyperparathyroidism (HPT) in the United States has been reported as 5-50 per 10,000 individuals. The disease is common in individuals older than 40 years and has a female-to-male ratio of 3:1. Secondary hyperparathyroidism (HPT) is a compensatory hyperfunctioning of the parathyroid glands caused by hypocalcemia or peripheral resistance to parathyroid hormone. As opposed to primary hyperparathyroidism (HPT), treating the underlying cause can reverse secondary hyperparathyroidism (HPT). The most common setting is in a patient with end-organ failure from chronic renal insufficiency, with hypocalcemia and hyperphosphatemia. Advanced age and malnutrition are risk factors for developing secondary hyperparathyroidism in patients with chronic kidney disease. Less commonly, secondary hyperparathyroidism may be caused by calcium malabsorption, osteomalacia, vitamin D deficiency, or deranged vitamin D metabolism. Tertiary hyperparathyroidism (HPT) occurs in a setting of previous secondary hyperparathyroidism (HPT) in which the glandular hyperfunction and hypersecretion continue despite correction of the underlying abnormality, as in renal transplantation. Hyperparathyroidism in pregnancy is a rare condition that can place the fetus at significant risk. Maternal calcium crosses the placenta resulting in chronic suppression of fetal parathyroid glands. Following delivery, neonatal serum calcium drops without maternal calcium provided through the placenta and profound perinatal hypocalcemia ensues. Neonatal parathyroid function returns in approximately 7-10 days. Current treatment recommendations include exploration with total parathyroidectomy and autotransplantation during the second trimester if possible. Familial hypocalciuric hypercalcemia (FHH) is a disease with an autosomal dominant mode of inheritance linked to a defect on chromosome 3. The exact mechanism of the disease is not known, but it appears that affected individuals have an abnormal calcium sensor. Parathyroid hormone levels may be elevated because of abnormal calcium detection. Because renal calcium resorption in these patients is greater than 99%, diagnosis is made by a calcium-to-creatinine clearance ratio of less than 0.010, while in those with primary hyperparathyroidism (HPT) the ratio is 0.015-0.040. Patients should have a family history positive for hypercalcemia. Surgery is not indicated in these individuals. Abnormalities of the third and fourth branchial pouches, such as DiGeorge syndrome, may lead to agenesis or dysgenesis of the parathyroid glands as well as athymia. Isolated familial cases of metabolic hypoparathyroidism have been reported. Some cases of hypoparathyroidism categorized as idiopathic may have an autoimmune basis and other endocrine deficiencies; T-cell dysfunction also may be involved. The exact cause of parathyroid adenoma is unknown. Single adenoma is the most common cause of hyperparathyroidism and may affect superior and inferior parathyroid glands. Histologically, adenomas are hypercellular and have very little fat when compared with normal glandular tissue. Fat content tends to increase with age (until age 25-30 years), thus comparison to a normal gland is important to ensure the diagnosis is adenoma. The adenoma may also be surrounded by a rim of normal parathyroid tissue. Chief cells, which have regular central nuclei, predominate. Foci of larger acidophilic oxyphilic cells and clear cells are present. Adenomas may have clear cell variants. Primary parathyroid hyperplasia is defined as proliferation of the parenchymal cells leading to an increase in gland weight in multiple parathyroid glands in the absence of a known stimulus for parathyroid hormone secretion. Two types of parathyroid hyperplasia exist: chief cell hyperplasia and water cell or clear cell hyperplasia. In primary hyperplasia, the most common finding is chief cell hyperplasia, although clear cell variants can rarely occur. Again, stromal fat is decreased in proportion to the magnitude of hyperplasia. A differentiating feature seen in approximately one third of adenomas but not in hyperplasia is a well-defined capsule separating the adenoma from normal parathyroid tissue. Distinguishing normal-functioning parathyroid glands from hyperfunctioning parathyroid glands visually is difficult. The mnemonic "painful bones, psychic moans, abdominal groans, and renal stones" has become largely historical because most patients present long before the disease progresses to multiple-system involvement. In the United States, the most common presentation of hyperparathyroidism (HPT) is an elevated serum calcium level reported on routine screening by a primary care physician and has been termed asymptomatic hyperparathyroidism. In the absence of overt abnormalities, one must be cautious as symptoms may be subtle. However, on careful questioning of an asymptomatic patient, one often can elicit subtle symptoms, such as nonspecific fatigue, weakness, musculoskeletal complaints, constipation, depression, or possibly a history of peptic ulcer, hypertension, cholelithiasis, pancreatitis, and gout or pseudogout. Additionally, prolonged hypercalcemia can lead to metastatic calcifications in blood vessels, soft tissues, and joints (chondrocalcinosis). The most common conduction abnormality observed with hypercalcemia is a shortened QT interval, which should be documented with an electrocardiogram. Calciphylaxis is a rare, but disastrous, dermatologic complication of hypercalcemia that occurs most frequently in patients with secondary hyperparathyroidism (HPT) and end-stage renal disease. Skin lesions begin as pink or mottled purpura that progress to ulceration and necrosis. Secondary infection and sepsis can develop and lead to mortality rates of greater than 80%. The exact mechanism is not known but is likely related to microvascular occlusion. Osteitis fibrosa cystica, in which subperiosteal bone resorption is followed by the formation of cysts that may distort bony architecture, is a rare presentation. The most commonly involved bones are the phalanges and distal clavicles; involvement of the mandible is less likely, and the maxilla is rarely affected. If hemorrhage into a cyst occurs, it is followed by giant cell reparative granulomas known as brown tumors. Diagnosis is confirmed by an elevated serum level of intact parathyroid hormone or high normal parathyroid hormone in the setting of hypercalcemia. Patients with hypoparathyroidism present with hypocalcemia, mental changes, and neuromuscular excitability or tetany. Anatomic abnormalities, though not readily apparent, include intracranial calcifications and cataract formation. Young children may have disturbed dentition. Severe hypercalcemia should be managed promptly with administration of intravenous fluids and a loop diuretic to block calcium resorption. Calcitonin (2-8 U/kg IV/IM/SC q6-12h) can lower serum calcium levels by inhibiting bone resorption, but tachyphylaxis occurs quickly. Bisphosphonates also inhibit bone resorption, but electrolyte abnormalities such as hyperphosphatemia or hypophosphatemia, hypocalcemia, and hypomagnesemia are common. Calcimimetics, such as cinacalcet (Sensipar), mimic circulating calcium in the blood in an attempt to cause the parathyroid glands to release less parathyroid hormone. This may be an option for patients with hyperparathyroidism who have failed surgical therapy or are not surgical candidates. Primary hyperparathyroidism (HPT) is usually managed surgically. Observation of primary hyperparathyroidism is reserved mainly for patients with comorbid conditions who cannot tolerate surgery or for very elderly patients who may die of another cause. In postmenopausal women with hyperparathyroidism, estrogen supplements and alendronate may help maintain bone density. Patients who do not undergo parathyroidectomy should be monitored at regular intervals with metabolic panels and assessment of bone mass (dual-energy radiographic absorptiometry [DRA] scan, bone mineral density). Removal of the abnormal gland is indicated for adenoma, and resection of 3.5 glands is the standard treatment for 4-gland hyperplasia. For a detailed discussion of surgical anatomy and technique, please refer to the article Minimally Invasive Surgery of the Parathyroid. For a discussion of preoperative localization studies for parathyroid adenoma and their impact on operative management, please refer to the article Minimally Invasive Surgery of the Parathyroid. Preoperative screening should include a serum calcium level and a confirmed elevated or inappropriately high normal intact parathyroid hormone level. Intact parathyroid hormone assay differentiates primary hyperparathyroidism (HPT) from hypercalcemia of malignancy because the parathyroid-related peptide secreted from some tumors is a much larger protein, which shares a 50% homology with the 36 N -terminal amino acids of parathyroid hormone. Many endocrinologists also recommend a 24-hour calcium collection for calculation of the calcium-to-creatinine clearance ratio to exclude familial hypocalciuric hypercalcemia (FHH). Calcium levels should be followed postoperatively. Because of chronic feedback suppression of normal parathyroid tissue, short-term hypocalcemia can be expected following most parathyroidectomies and is generally left untreated unless serum calcium is markedly decreased or the patient becomes symptomatic; some favor empiric treatment with oral vitamin D-3 and calcium. Hungry bone syndrome is a condition that may follow parathyroidectomy; it is marked by hypocalcemia and hypophosphatemia. It is usually seen in patients with long-standing hyperparathyroidism (HPT) and extensive bone resorption. The proposed mechanism is a rebound uptake of calcium and phosphorus by bones, which have long been starved of these metabolites. If symptomatic, treatment is IV calcium. Serum calcium should be monitored several weeks after surgery until calcium levels have stabilized. Calcium and parathyroid hormone (PTH) are checked 6 months postoperatively to exclude persistent hyperparathyroidism (HPT). Disruption of vascular supply may lead to hypoparathyroidism, particularly when all four glands are dissected or a gland is autotransplanted. Patients with hypoparathyroidism are treated with oral calcium and vitamin D; intravenous calcium is reserved for severe or symptomatic hypocalcemia. When at least one parathyroid gland is identified and preserved, parathyroid hormone levels usually return to normal, but four-gland removal can lead to permanent hypoparathyroidism. Temporary hypocalcemia is a common consequence of parathyroidectomy. Other short-term complications of parathyroidectomy include true vocal fold paralysis/paresis (due to subtle, recurrent laryngeal nerve injury), bleeding, hematoma, and, rarely, wound infection. Persistent hypoparathyroidism is an uncommon consequence that requires long-term calcium and vitamin D-3 supplementation. Severe, recurrent laryngeal nerve injury resulting in permanent paralysis may be well compensated over time, but voice complaints or aspiration may warrant vocal fold medialization. Cure rate following initial parathyroidectomy is 95-97%. Reexploration for recurrent or persistent hypercalcemia has a slightly lower success rate of 85-90%. Recent identification and cloning of the calcium sensor in the parathyroid gland has opened speculation into pharmacologic inhibition of parathyroid hormone (PTH) release. A calcium sensor–activing drug has been studied in a phase 2 trial for secondary hyperparathyroidism. Until such a drug is approved, however, primary hyperparathyroidism (HPT) remains a surgical disease. For a detailed discussion of the anatomy of parathyroid glands, please refer to the article Minimally Invasive Surgery of the Parathyroid. Vaidya A, Curhan GC, Paik JM, Wang M, Taylor EN. Physical Activity and the Risk of Primary Hyperparathyroidism. J Clin Endocrinol Metab. 2016 Jan 26. jc20153836. [Medline]. Maeda SS, Moreira CA, Borba VZC, et al. Diagnosis and treatment of hypoparathyroidism: a position statement from the Brazilian Society of Endocrinology and Metabolism. Arch Endocrinol Metab. 2018 Feb. 62 (1):106-24. [Medline]. [Full Text]. Marcucci G, Cianferotti L, Parri S, et al. HypoparaNet: A Database of Chronic Hypoparathyroidism Based on Expert Medical-Surgical Centers in Italy. Calcif Tissue Int. 2018 Aug. 103 (2):151-63. [Medline]. Nawrot I, Pragacz A, Pragacz K, et al. Total thyroidectomy is associated with increased prevalence of permanent hypoparathyroidism. Med Sci Monit. 2014 Sep 19. 20:1675-81. [Medline]. [Full Text]. Almquist M, Ivarsson K, Nordenstrom E, Bergenfelz A. Mortality in patients with permanent hypoparathyroidism after total thyroidectomy. Br J Surg. 2018 Sep. 105 (10):1313-8. [Medline]. Bassler T, Wong ET, Brynes RK. Osteitis fibrosa cystica simulating metastatic tumor. An almost-forgotten relationship. Am J Clin Pathol. 1993 Dec. 100(6):697-700. [Medline]. Rochtus A, Martin-Trujillo A, Izzi B, et al. Genome-wide DNA methylation analysis of pseudohypoparathyroidism patients with GNAS imprinting defects. Clin Epigenetics. 2016. 8:10. [Medline]. [Guideline] Bilezikian JP, Brandi ML, Eastell R, et al. Guidelines for the management of asymptomatic primary hyperparathyroidism: summary statement from the Fourth International Workshop. J Clin Endocrinol Metab. 2014 Aug 27. 99:3561-3569. [Medline]. Riss P, Kaczirek K, Heinz G, Bieglmayer C, Niederle B. A "defined baseline" in PTH monitoring increases surgical success in patients with multiple gland disease. Surgery. 2007 Sep. 142 (3):398-404. [Medline]. Lombardi CP, Raffaelli M, Traini E, et al. Intraoperative PTH monitoring during parathyroidectomy: the need for stricter criteria to detect multiglandular disease. Langenbecks Arch Surg. 2008 Sep. 393 (5):639-45. [Medline]. Nussbaum SR, Thompson AR, Hutcheson KA, Gaz RD, Wang CA. Intraoperative measurement of parathyroid hormone in the surgical management of hyperparathyroidism. Surgery. 1988 Dec. 104 (6):1121-7. [Medline]. Gioviale MC, Damiano G, Altomare R, et al. Intraoperative measurement of parathyroid hormone: a Copernican revolution in the surgical treatment of hyperparathyroidism. Int J Surg. 2016 Apr. 28 Suppl 1:S99-S102. [Medline]. Somnay YR, Weinlander E, Alfhefdi A, Schneider D, Sippel RS, Chen H. Radioguided parathyroidectomy for tertiary hyperparathyroidism. J Surg Res. 2015 May 15. 195 (2):406-11. [Medline]. Chen J, Wang JD. Radioguided parathyroidectomy in patients with secondary hyperparathyroidism due to chronic renal failure. Nucl Med Commun. 2014 Apr. 35 (4):391-7. [Medline]. Ali M, Kumpe DA. Embolization of bronchial artery-supplied ectopic parathyroid adenomas located in the aortopulmonary window. J Vasc Interv Radiol. 2014 Jan. 25 (1):138-43. [Medline]. Bushinsky DA, Block GA, Martin KJ, et al. Treatment of Secondary Hyperparathyroidism: Results of a Phase 2 Trial Evaluating an Intravenous Peptide Agonist of the Calcium-Sensing Receptor. Am J Nephrol. 2015. 42 (5):379-88. [Medline].